john4jack (Corvallis, Oregon, United States) on 24 August 2009 in Business & Industry and Portfolio. Being neat and orderly is not a hallmark of a working boatyard. Blimey, how could one find anything!!!!! I love the wood on that boat! Great shot! C'est souvent la vie qu'il y a autour des bateaux en réparation. @Sof: Absolutely. Just like us; right?? @Nicholas: Not unlike my desk. NOT!! Nice shot, and perfect title. Would be a good ST shot. I love looking at all that disorderly detail. It sets my imagination going. Your photo is superb in story, detail, clear focus and lovely color quality. @Anina: Thanks, Anina. They probably find things the same way that I can go straight to the piece of paper that I want on my chaotic desk (it drives my wife nuts). Like this a lot. A nice capture. Like the confusion. @Ana Lúcia: For those of us who tend to be messy, this is somewhat reassuring!! Having some big renovation may be with all the stuff around. Oh I like very much this atmosphere of shipyard ! Very beautiful colors ! ha! CHAOS! Great capture, there's plenty to take in on this one!! I'm too neat, so this is my worst nightmare! :) Great chaotic shot! @Monique: Just so you know, it is not a paradigm of my mind!!! Cool catch!!! perfect title too!! wow..great catch..lots going on here ! "Organized" chaos! ? Wonderful shot! I love that you included all that stuff, Great story telling! Great lines,shapes and colours.Love it !! A marvelous scene to spot and shoot! I think it's the 'sea' version of the RVs we see permanently parked and used a living quarters. A fine shot. So true. And such a great visual representation of that fact. @Viewfinder: Having recently spent a bunch of time in SF, you should appreciate tomorrow's Silly Tuesday shot. I can only imagine the amount of rodents would find in there. I would think that you could just sit down and wait, and snap away. It's quite colorful though. Great shot. Brilliant image with super framing !!!! Wow, there's sure a lot going on. Looks like my computer desk at times! :-) Great composition and colors. @Ajay: First, you get a bulldozer and clear out around it!! @dj.tigersprout: HDR? - answer, Yes; we had a wide range of light that morning. I use HDR primarily to cover range of light. When I use Photomatix, I keep it as bland as possible, and then do my major color work in LR and PS. Because I use Nik's "Tonal Contrast" filter in Color Efex, sometimes people think that it is an HDR image when it is not. But in this case, it was HDR. I love that series, jack, I am fascinated by everything related to the sea! @marc battault: You and me both, Marc. Most of my life, I have lived close to the sea. you really got neat and orderly from total chaos. Still not sold on hdr but you are using it to its advantage. @shallowregret: The easiest way to avoid HDR is by using Split ND filters with the camera, but that also has its problems when you have a complicated scene. And, you can deal with a dynamic range that exceeds the capacity of the camera by what is often time-consuming work in PS. My tendency is to do things the easiest way possible; that is, unless I am going to print the photograph; then, I am willing to do whatever work is required. When posting every day on Am3, I don't have either the time or the energy to do extensive post-processing. Part of the problem is that I really don't like spending time in the digital darkroom. Merci, Karine. You're right; it does look like a toy. Another interesting shot of the dock... and all the things there. This is great Jack! I really like the 'stuff' that is in this shot...showing all the things that come with boats and being in a shipyard. Well seen and documented. @bluechameleon: Thanks, Sharon. We visited a number of boatyards on that trip. They are a photographer's gold mine. 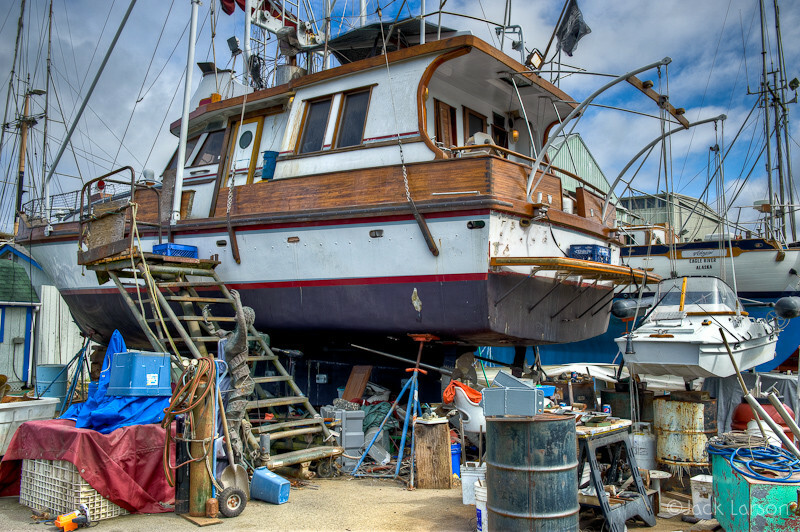 A funny title for a very typical and active boatyard scene. 'Work' is the keyword and this is a great shot! Looks more like organized chaos to me! So much to see, so much detail. I like the bright colors, too. I love all the lines and angles you have captured here. The boat seems to be floating. There's also a sense of 3-D that I see here when I look at the dingy (assuming that's what it is). The dingy looks like it could be a boat in the distance because it seems so small...Aptly titled. The first thing I thought of is what you said to Anina. We may see it cluttered, but the person knows where everything is. That is one huge pile of stuff. How is this possible for these things to still stand one on another w/o anything falling apart. Amazing capture. Great work. @baobab: There may be some truth in that. I'm a slob at home, but my backpack is obsessively orderly. nice capture ! we have the same scene here, in La Rochelle, it's very common for us ! nice colors ! She looks like a fine boat: albeit a bit crowded. Great shot, Jack! @StarCosmosBleu: If it wasn't a "working boats" yard, it probably wouldn't be. This actually is across the road from the marina.